Polltullyard: entrance passage in cherty facies of the Dartry Limestone. The entrance to Polltullyard is at the base of a large depression which leads on to a soil slope. This chute ends in a 20m passage of comfortable walking height but with a clinging mud floor. 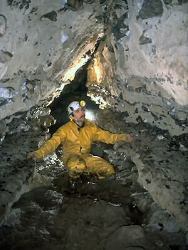 This section of the cave is developed in cherty limestone of the Dartry Formation. The passage ends at a 30m vertical shaft in the Knockmore Limestone Member, a rock prone to extensive vertical karst developments throughout the area. At the foot of this pitch the main stream enters the passage and flows into boulders where it disappears. A boulder slope on the downstream side enters a boulder-filled chamber after 25m. From here a 30m crawl relocates the stream, which promptly vanishes again into a narrow rift. On the upstream side, a 4m climb enters 200m of well developed but now abandoned phreatic (formed below the water table) passages, with the stream now flowing along a vadose (formed above the water table) ‘canyon’ cut into the base of the phreatic tube. The passage ends in another boulder chamber which narrows to an impenetrable cleft. Most of the boulders in the system are of locally derived Carboniferous gritstone.